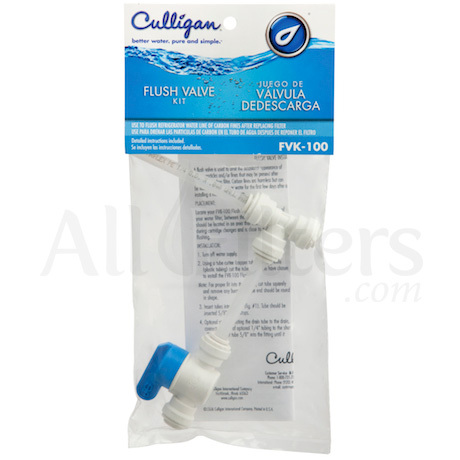 Culligan FVK-100 Water Filter Flush Valve Kit - ON SALE! Used to omit the occasional appearance of carbon particles and/or fines that may be present after changing a carbon filter. Can be used for any inline water filter with 1/4" tubing. 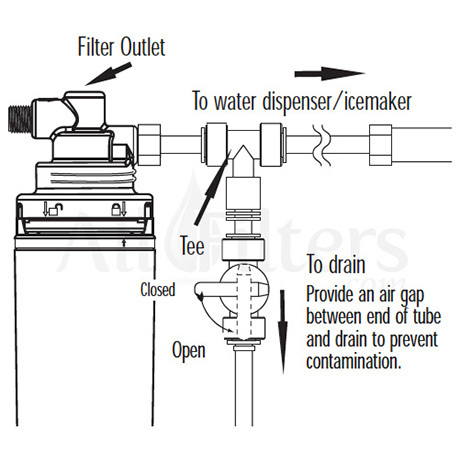 Locate your FVK-100 Flush Valve on the outlet side of your water filter, between the filter and appliance. It should be located in an area that allows easy access during cartridge changes and is close to a drain for flushing. Using a tube cutter (copper tube) or utility knife (plastic tubing), cut the tube where you have chosen to install the FVK-100 Flush Valve. Insert tubes into the tee (see the image #2). Tube should be inserted 5/8" until it stops. OPTIONAL STEP: If routing the drain tube to the drain, connect one end of optional 1/4" tubing to the shut-off valve. Insert tube 5/8" into the fitting until it stops. Position tube to drain. Be careful not to crimp tube.